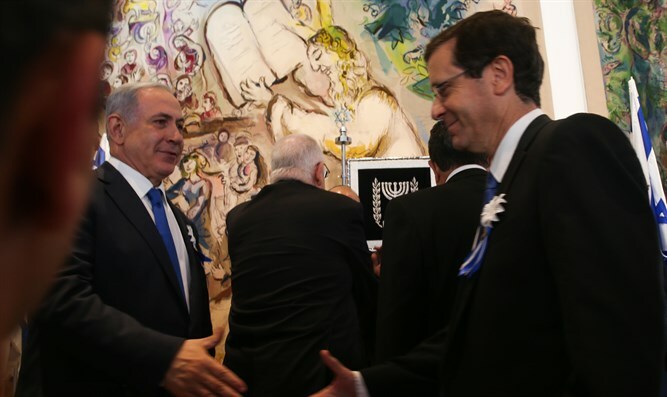 Report claims Netanyahu offered Herzog unity government to advance peace talks, then backtracked. Israeli Prime Minister Binyamin Netanyahu offered a plan to form a unity government with Israel's opposition last year as part of a regional peace bid, but later backtracked, a newspaper reported Sunday. The plan centered on a document delivered to opposition leader Yitzhak Herzog (Zionist Union) in September, but Netanyahu later pulled back and talks collapsed in October, Haaretz reported. Spokesmen for Netanyahu and Herzog did not immediately respond to requests for comment. The effort came as moves were underway to restart peace talks with the Palestinian Authority through a process which would include Arab countries in the region. The document reportedly delivered to Herzog in September was a proposal for a joint declaration reiterating their commitment to a two-state solution and their desire to seek a resolution with the Arabs. It came some seven months after a previously reported secret meeting between Netanyahu, Egyptian President Abdel Fattah al-Sisi, Jordan's King Abdullah II and then US secretary of state John Kerry, which saw Kerry pitch a last-minute regional peace effort. Under Netanyahu's plan, the draft document negotiated with Herzog was to be submitted at a summit in Egypt in October to launch a regional peace initiative. The two men were then to announce negotiations for the formation of a unity government after returning from the summit, which ultimately did not occur, the report said. The report also claimed Netanyahu later told Herzog he wanted to resolve controversy surrounding the evacuation of Amona first, and talks later collapsed. In November, Herzog said there would be no unity government and he would no longer hold coalition talks with Netanyahu.